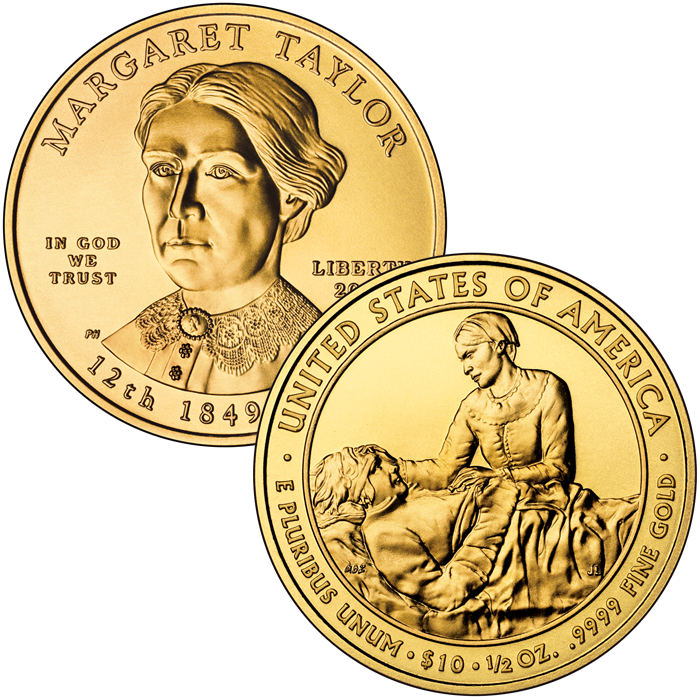 The 2009-W $10 Margaret Taylor First Spouse Gold Uncirculated Coin is the thirteenth coin from the US Mint struck to honor the spouses of the former Presidents of the United States. Each $10 face value coin in the series is struck from 1/2 ounce of 24-karat gold. This makes the coin’s intrinsic value worth much more than it’s face value indicates. The coin honoring Margaret Taylor features a portrait of her on the obverse and an image showing her comforting a wounded soldier during the Seminole War. Typically, only four spouse coins are issued annually. However, John Tyler’s first wife Letitia passed away during his second year in office. He then re-married Julia. As such, both former First Ladies are honored on separate coins. 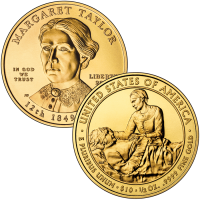 Initial price on the Margaret Taylor Uncirculated Coin was $741. United States Mint Sculptor-Engraver Phebe Hemphill designed the portrait of Margaret found on the obverse (heads side) of the coin. It was sculpted by Sculptor-Engraver Charles L. Vickers.